A joint development between The Sher Corporation and Hyde Park Homes.The development site is located at the southeast corner of Shuter and Mutual Streets, just north of Moss Park. 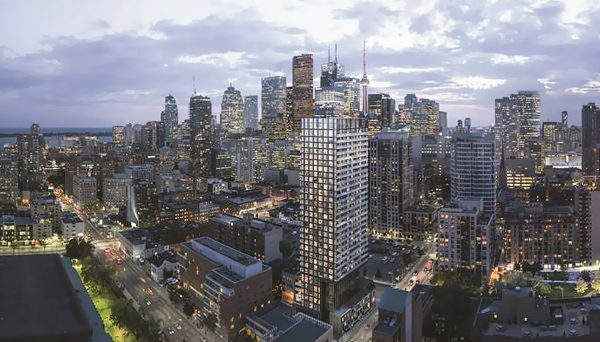 This new development project is in the pre-construction phase and is proposed for the Garden District neighbourhood of downtown Toronto. 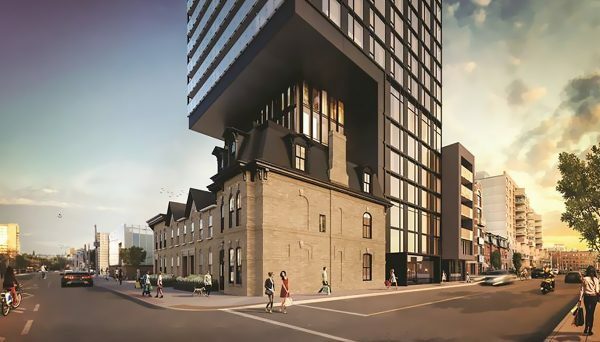 The proposal is calling for a 32-storey tower with 234 residential units, including a 2.5-storey base, which will consist of an existing heritage building on the site. The heritage building’s façade will be restored and incorporated into the base, which will contain a residential lobby and amenity space. The project will also feature a selection of two-level town homes, which feature entries from the interior of the base building. ArchitectsAlliance is designing the contemporary tower portion of the building, and they have released renderings showing a modern design, featuring symmetrical lines and a glazed façade. The distinctly urban structure will be a perfect complement to the neighbourhood’s ongoing transformation, while the restored, heritage-inspired base will pay homage to the area’s historical roots. The interior of the development will be equally as trendy and sleek as its exterior. The unit mix is expected to include 163 one-bedroom layouts, 62 two-bedroom and 26 three-bedroom layouts. Finishes inside the suites include high ceilings, wood inspired laminate flooring, trendy exposed concrete walls, sliding or swing doors, wire shelving, and spacious balconies. Kitchens will also come complete with high end appliances, to round out residents' luxury experience living in this development. Floors two through seven will feature a total of 5,403 square-feet of indoor amenity space and 1,237 square feet of outdoor amenity space. Floor seven will specifically be home to a childrens playroom, lounge, kitchen, dining area, meeting room, and a games and media room. A pet spa will also be available on the premises, and is slated to include a shower, dryer and trimming station. Other amenities at residents' finger tips will also include a two-storey gym with an outdoor terrace. The terrace will feature built in barbecues, fire pits, lounge seating and gardens. Residents will also have use of 48 parking spaces proposed in an underground garage, along with 252 bicycle spaces. Condos in Toronto’s Garden District have the advantage of being centrally located in the heart of the city. This small pocket, just east of Dundas Square, is located in the “downtown area” of Toronto’s official plan, an area considered a cornerstone of the city’s growth management strategy and the pre-eminent urban growth centre within the GTA. The site of this new building and the surrounding block sit in the midst of a diverse and rapidly-developing downtown area that has seen a significant increase in residential and mixed-use revitalization, particularly over the last decade. Immediately west of the site is a large-scale, mixed-use project, which includes three 28-storey towers with retail and commercial use at street level. Other developments proposed in the immediate area include a luxury hotel and condominium building and a mixed-use development including a public park. It’s an exciting and rapidly-growing place to invest in and its proximity to the downtown core will likely continue to attract residents who crave a high-energy, urban environment. Many other major attractions nearby have also been growing, including the newly-expanded Ryerson University – just north – and St. Michael’s Hospital, a world-class medical facility. The site is close to the Eaton Centre and a wealth of shopping, dining and entertainment options in the area around Dundas Square, just west of the site. Two streetcars are just steps from the site and Dundas station is a few minutes’ walk, putting you right at the epicentre of downtown transit. From there, it’s a short commute to a number of high-density employment districts, like the Financial District and the Bay Street Corridor. Many of the region’s top post-secondary institutions, such as Ryerson University, George Brown College and the University of Toronto are equally easy to get to, making this spot an excellent option if you’re in the market for an income property. This developer knows this part of the city, having built or proposed a selection of modern, luxury condominiums in the surrounding area already. Their strong understanding of urban design and sense of progressive modernism makes all their developments stand out, adding architectural value to each neighbourhood they inhabit. The company’s founder, Shakeel Walji, has almost 25 years of experience in the real estate market and worked in the engineering field before launching his successful development organization. Read more about The Sher Corporation. 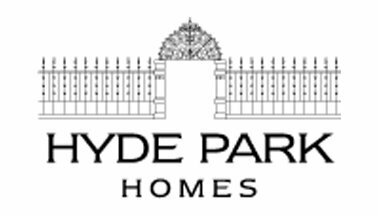 Hyde Park Homes has worked in real estate investment, development and construction for over 50 years and their experience is showcased in an extensive portfolio of housing types throughout the GTA. This is the second high-rise they’ve partnered with the Sher Corporation for. Read more about Hyde Park Homes.